Tunis: Saudi Arabia’s foreign minister, Ebrahim Al Assaf, has condemned Iran’s interfence in the Arab world, particularly in Syria and Yemen. He was speaking at a meeting of Arab foreign ministers in Tunisia, ahead of Sunday’s annual Arab Summit meeting. Arabs have long complained of Iran’s meddling in their internal affairs and fomenting sectarian strife in the region. Arab leaders will be meeting during a time where Syria is wrapping up its eight-year civil war, while rival factions in Yemen and Libya are still at war. 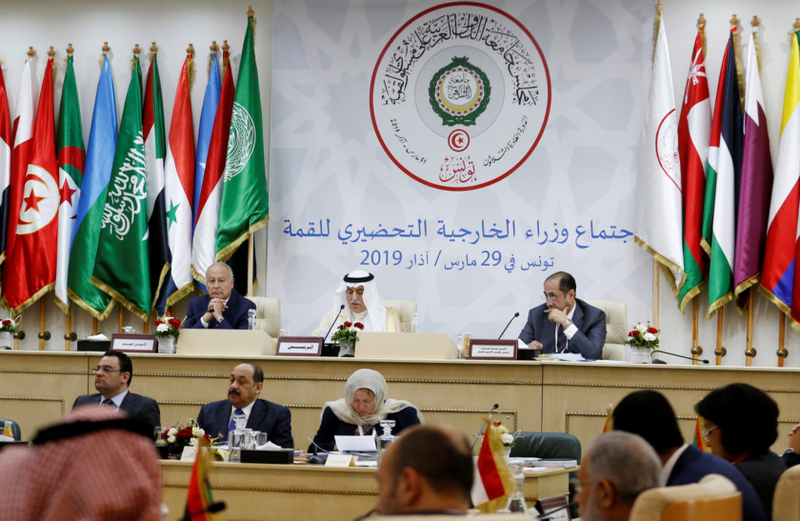 Arab League Chief, Ahmad Abu Al Gheit, called on Friday for a political solution in all three countries. Meanwhile, Al Assaf said that he hopes to unify the Syrian opposition ahead of talks with the Syrian regime. While Bashar Al Assad has seemingly won the war—with the help of Iran and Russia—there is still pressure in the international community for him to make political concessions. While is its unclear whether an emboldened Al Assad will feel the need to do so, a unified Syrian opposition would be essential in getting any sort of concessions out of him. The war has left nearly a half a million people dead and created millions of refugees in what was dubbed as the worst humanitarian crisis of the 21st cenutry. Syria remains expelled from the Arab League since the war began in 2011, but some Arab states want Syria to be readmited. Syria will not be attending Sunday’s meeting as a consensus has not been reached yet whether or not to let Syria back in. However, more Arab leaders have been testing the waters for rapproachment with Syria. In December Sudanese President Omar Al Bashir was the first Arab leader to visit Damascus and meet with Al Assad. Later in the month, the UAE reopened its embassy in the Syrian capital. Some Gulf states prefer to reengage with Al Assad to bring Syria back into the Arab fold as Iran and Turkey currently hold major sway inside the country. Another focus of the Arab Leage summit, will be the US recognition of the Occupied Golan as Israeli. Israel occupied the Syrian territory during the 1967 war and later annexed it in 1981 in a move not recognised internationally. However, the US administration of Donald Trump, in an unprecedented move, recognised Israeli sovereignty in the Golan, this past week. It was widely condemned by Arab and regional leaders and will figure prominently at Sunday’s summit. On Friday, Abu Al Gheit reitterated that the Golan was Syrian territory, rejecting the recent US decision. Arab leaders hope to project unified opposition to the Trump administration’s acceptance of Israeli occupation over the Golan Heights and Jerusalem. This year, Algeria’s ailing President Abdul Aziz Bouteflika and Al Bashir will skip the meeting as they contend with weekly mass protests against their long reigns. The protests in both countries will also not be on the summit’s agenda. Earlier this week, Algeria’s top general called for initiating a constitutional process to declare Bouteflika unfit to serve, in a bid to address the mass protests held since Feb. 22. But opposition parties denounced the idea, fearing it would leave the secretive elite in power. In Sudan, protests sparked by an economic crisis in December quickly morphed into calls for the resignation of Al Bashir, who seized power in an Islamist-backed military coup in 1989. He has shown no sign of stepping down. Palestine will also ask the Arab summit in Tunis to announce a clear stance towards Trump’s ‘Deal of the Century’ for peace with Israel,” Al Maliki said.